The locale breakdown of districts, schools and students in Michigan differs in some ways from the rest of the United States. 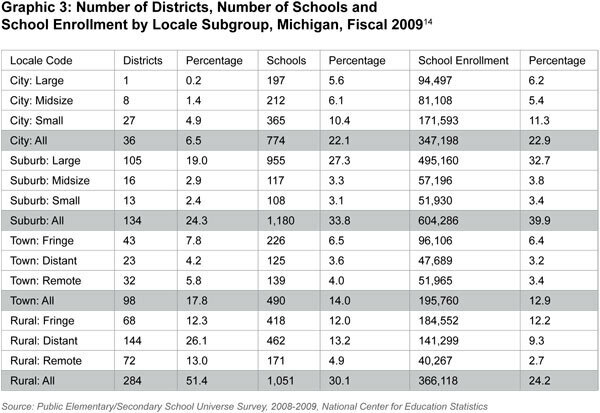 As with the nation as a whole, most students in Michigan go to suburban schools, and of those suburban students, most attend schools in large suburban areas (see Graphic 3). 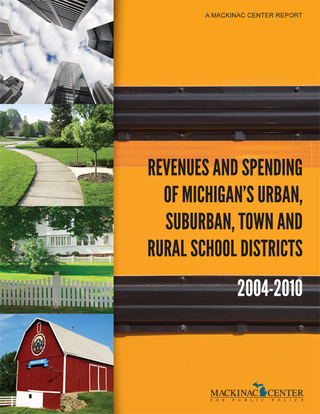 But in contrast to the nation as a whole, Michigan’s rural schools enroll the second-largest group of students in the state, with city schools enrolling the third-largest. Reflecting national figures, the fewest students were located in town schools. A smaller proportion of students in Michigan than in the rest of the country attend city schools. About 29 percent of students around the country are educated in city schools, but in Michigan, less than one-quarter are. The most striking difference in locale composition between Michigan and the nation pertains to large cities. Nationally, about 15 percent of students attend public schools in large cities, but in Michigan, only about 6 percent do. In fact, these students attend the only Michigan school district — the Detroit Public Schools — that meets the NCES definition of a large city district. “Public Elementary/Secondary School Universe Survey, 2008-2009” (National Center for Education Statistics, 2009), http://nces.ed.gov/ccd/bat/ (accessed Feb. 23, 2011); “Local Education Universe Survey, 2008-2009” (National Center for Education Statistics, 2009), http://nces.ed.gov/ccd/bat/ (accessed Feb. 23, 2011).